North West property investment firm Knight Knox International, in partnership with Fortis Developments, has announced the launch of its latest student development located in the heart of Middlesbrough – Rede House. The former office block on Corporation Road will contain 230 studios, once complete. 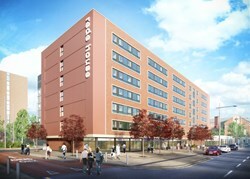 A conversion of a former office block on Corporation Road, the building will contain 230 studios, in addition to a host of communal facilities designed specifically with students in mind, including a lounge and entertainment room, fully-equipped gymnasium, laundry room and secure bicycle storage. The project is Knight Knox International’s 23rd exclusive student development, but its first in Middlesbrough, as the firm decides to diversify into the Midlands market. Situated just an eight-minute walk away from Teesside University and less than a minute’s walk from world-famous venue The Empire, Rede House is set to be an ideal location for students studying in the city. The ground floor of the office block will continue to be used as retail space, with the five large units set to be of great convenience to students residing in the development. A planning application has been submitted to Middlesbrough City Council and, if approved, the development will be completed in time for the September 2014 intake. Units are now available to purchase from Knight Knox International at an exclusive pre-launch price of £33,995 for a standard studio, although deluxe and premium studios are available for a higher price. Investors are offered up to 9.5% NET rental returns for the first 2 years. A market leader in worldwide property investments, Knight Knox International offers an extensive range of property and services on a global scale. Specialising in student accommodation and residential buy-to-let, Knight Knox International has over 12 completed student developments to its name and has launched nine residential developments in the last year. In addition to being a specialist in the UK market, Knight Knox International has also established strong on-the-ground relations with overseas experts, ensuring only the best overseas investment opportunities are brought on to market.